Darts is a multiplayer minigame in WarioWare: Smooth Moves. It allows up to four players, each of them using a Mii as their avatar. The game plays very similarly to standard darts; every round, each player throws three darts at a dartboard, each section of the board corresponding to different point values, with the goal of getting exactly 301 points. If a player gets more than 301 points in a round, the points for that round are lost. The game ends when either a player gets exactly 301 points (at which point they're declared the victor) or ten rounds have passed. 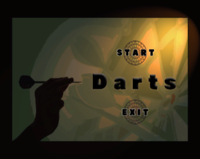 Though the menu lists the minigame's name as Darts, the title card refers to it as Dart Club. This page was last edited on April 5, 2018, at 13:11.